Trees are a part of our lives, we often pass them by without notice, a familiar forgotten part of our daily surroundings. I was reflecting on how trees provide color, shade, oxygen, a home for wildlife, beauty, food, fuel and mark the seasons of our lives. Trees also teach us valuable lessons of diversity and perseverance and value. Recently a major wind event felled a number of trees in our neighborhoods. When they crashed it was a good reminder of necessary maintenance, planning and development to battle the ever present effects of entropy. For example, to have strong trunks, tree trunks should be tapered from top to bottom. Trees develop tapered trunks from two major events in their lives: trunks swaying back and forth in the wind and the presence of branches with leaves all along the trunk. These lessons are learned early in the life of a tree and its development. Without it they won’t be able to support the canopy of the tree when the storms of life arrive. It is just like humans, the most intelligent have the ability to hold two opposing views in their mind and still be able to function. 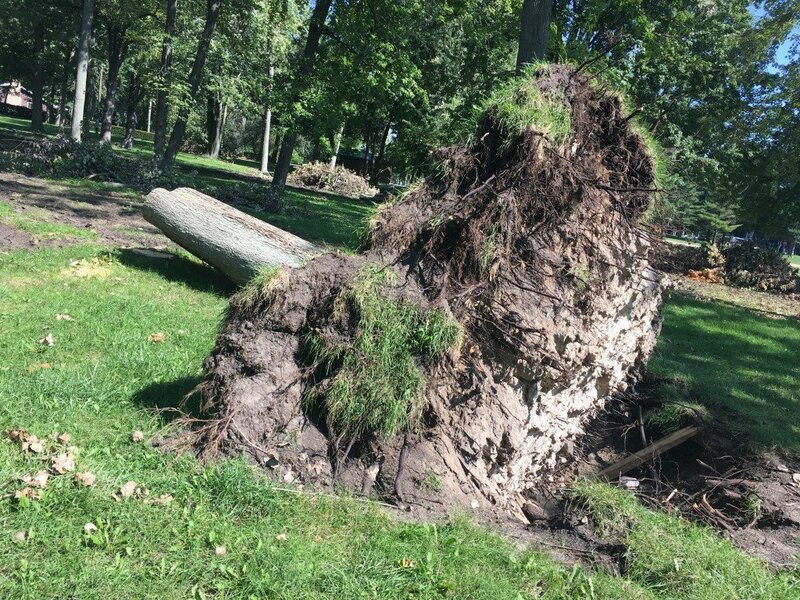 The wind event reminded us of the importance of a tree’s root collar. It is the area where the roots join the main stem or trunk. At the base of the tree there is a “flare” leading to the major roots. The root collar is part of the tree’s trunk. 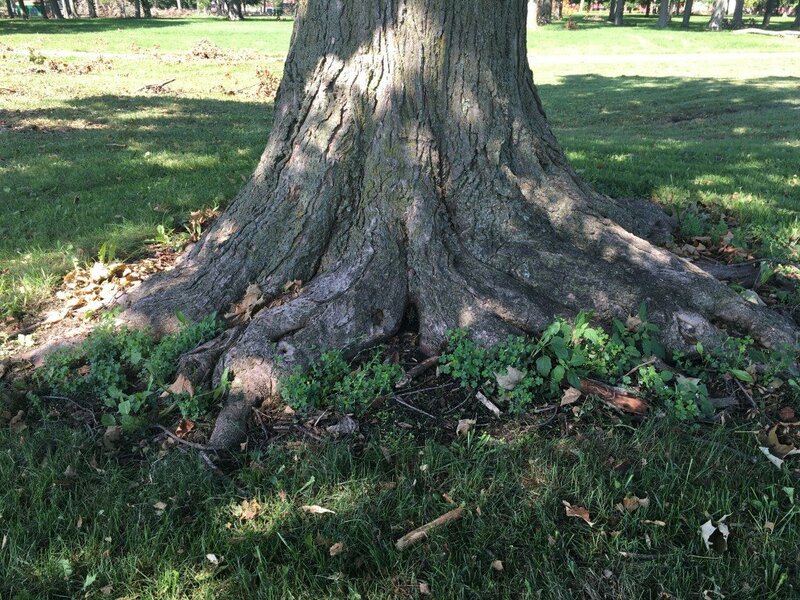 Unlike roots, the trunk is not specialized to resist constant soil moisture. If the tree is planted originally too deep or has soil or mulch mounded against the root collar and bark that is not accustomed to being wet, we will eventually see decline and ultimately failure of the tree at some point. Root collar from the start makes a difference. 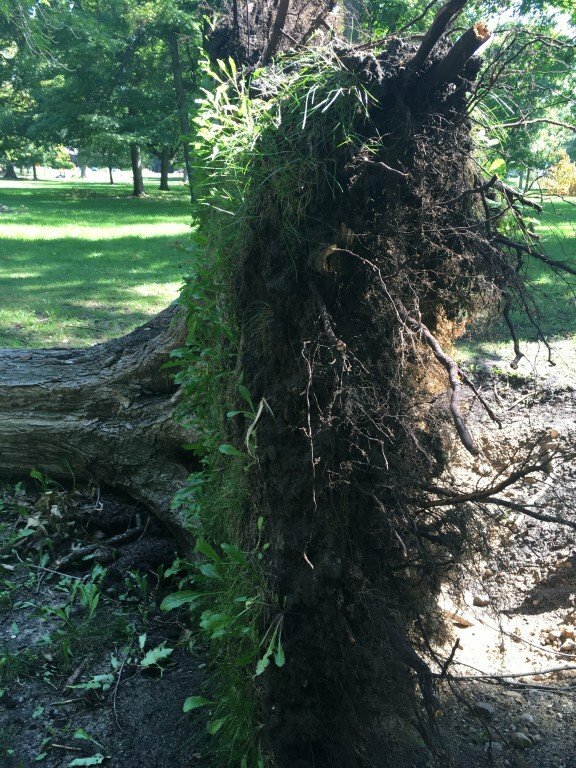 Strong root collars still experienced a condition called wind throw because support from the lateral roots was diminished due to surrounding driveways, walks, streets or other factors diminishing a stable lateral root system. We saw the entire tree roots and all lift out of the ground and topple over.